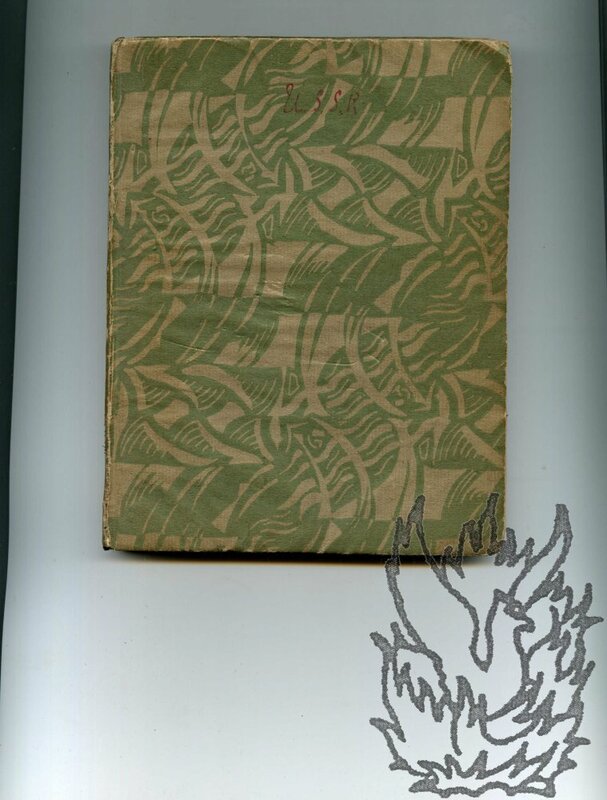 Three issues, printed paper wraps, 4to, some staining and rusted staples, mainly good+. "An interesting perspective on world affairs and Cold War issues". As far as I can trell from COPAC and WorldCat, no British or US library hold any issues. [ Soviet Invasion of Czechoslovakia, 1968. ] 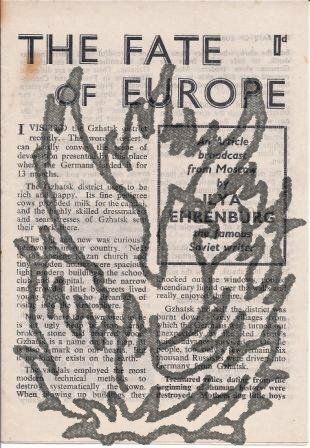 Duplicated typed document issued by 'Kilburn VSC', titled 'Czechoslovakia - A Marxist Analysis'. At foot: 'published by Kilburn VSC, 329a West End Lane, London NW6' [ 1968 ]. 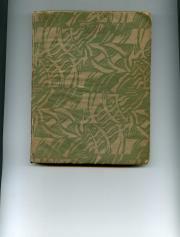 1p., folio. Printed in red. Sixty lines of text. In fair conditon, lightly aged and worn. The first paragraph reads: 'The Soviet invasion of Czechoslovakia has provoked the expected emotional outburst from the reformist Left, tailing as usual behind the hypocritical phrases of the British ruling class, who weep over "poor Czechoslovakia" while actively supporting the 100-times-worse suffering inflicted by the US on the Vietnamese. [ Unity Theatre, London, 1944. ] 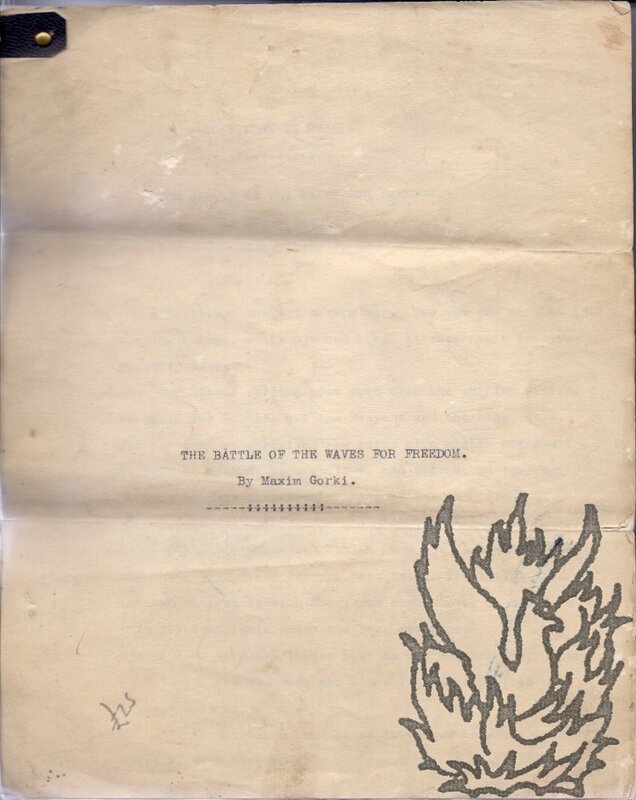 Unpublished typescript of the first Soviet thriller performed in London, under the title 'Comrade Detective': '"Face to Face" | A Soviet Thriller | by | Bros. Tour and L. Sheynin | Translated by Herbert Marshall'. 114pp., 4to. Typescript by May Hemery Ltd in black and red ink, with pages on rectos only. In black card covers, with label on front. In good condition, with light signs of age and wear, in worn covers. See Steve Nicholson, 'British theatre and the Red Peril: the Portrayal of Communism 1917-1945': 'Originally called 'Face to Face', 'Comrade Detective' was translated, designed and produced by Herbert Marshall on the suggestion of the wife of the Soviet Ambassador. [ Belfrage; Soviet spies ] Typed Note Signed "Cedric" to "Adrian". Cedric Belfrage, Film Critic, journalist, writer, political activist, MI6 Agent, alleged Soviet spy. [Typed heading] Cedric Belfrage, 49 Hallam Street, London W1, 13 July [c.1944]. One page, 8vo, fold marks, good condition. I've been hoping for an opening so as to make that excursion to Gerrards Cross, but alas it has not opened. Now I am completely involved in a Shaef [SHAEF = Supreme Headquarters Allied Expeditionary Force] press job and hope to be over the water very soon - so such delights fade from view. || It's a disappointment - it would have been fun to dish the dirt with you - but there's always after the war and by that time they'll be more dirt. "BBC website headline: "Cedric Belfrage, the WW2 spy Britain was embarrassed to pursue"
[Printed pro-Polish and anti-Soviet pamphlet.] The Polish Conspiracy? By H. W. Henderson. [Second edition, revised.] Published by H. W. Henderson, 44 Maxwell Drive, Glasgow. [Kirkwood (Printers) Limited, Glasgow. No date . 15pp., 16mo. Fair, on aged and lightly-worn paper. In an 'Introduction' on the reverse of the title, Henderson explains that he thinks 'a second edition of the pamphlet would be timely, the more so that the presentation of Polish-Soviet relations in their true perspective is of great importance to the Allies.' In writing the pamphlet his 'purpose was primarily to reply to Mr. 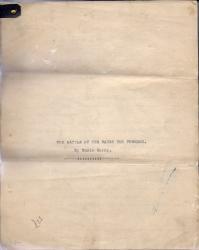 Printed pamphlet issued by the Georgia Committee, and titled 'The Acid Test', containing the article 'The Acid Test for the Bolsheviks' by Robert Lynd, and a list of 'important dates in the recent history of Georgia'. 4pp., 12mo. Bifolium. On lightly-aged and creased paper, with short closed tear at centre of gutter. The first page is headed 'THE ACID TEST', and carries an announcement by Maurice, Roberts and Dryhurst, reading: 'The Georgia Committee, first formed in 1906 as the "Georgia Relief Committee," was revived in 1922 by the friends of Georgian Independence, and is open for membership to all supporters of the Rights of Small Nations. [Pamphlet.] The Fate of Europe. 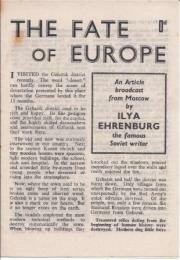 An Article broadcast from Moscow by Ilya Ehrenburg the famous Soviet writer. 12mo, 8 pp. Slight damage from rust of paperclip, otherwise good, on aged paper. Priced at '0d'. Photograph of Ehrenburg on p.3. The slug carries the code 'CP/C/31/4/43. ', the last three elements indicating the date of publication. Scarce: COPAC only lists a microfilm reproduction at the British Library. Good, bold signature on slip of laid paper (presumably cut from letter) roughly 3.5 x 11.5 cm. In good condition. Simply reads 'Beatrice Webb'. Dimensions of photograph roughly nine inches by seven wide. Aged, lightly creased and a little scuffed. Slight loss to bottom right-hand corner of border, not affecting image. A bespectacled Malko in a double-breasted pinstripe jacket, in the act of conducting, baton aloft, and with violinist in the background. Malko has written his inscription over his torso, beginning 'Cnacudo', and giving the date 1949. The dethronement of Stalin full text of the Khrushchev speech. Published by the MANCHESTER GUARDIAN | June 1956'. 33 pages, 8vo. In original printed wraps, with cartoon of Khrushchev on front wrap. In good condition, with slight spotting and staining to front wrap. Rust stains from staples and from paperclip at heads of front wrap and first leaf. Offsetting to inside of front wrap from newspaper cutting of article by Walter Lippman, 'WHAT KHRUSHCHEV DID NOT SAY ABOUT THE TERROR | Stalin Insufficient as Scapegoat'. Introduction by 'A STUDENT OF SOVIET AFFAIRS'. Internally subtitled 'The unmasking of Stalin'.